M23 threaded coupling connectors are mainly used for integrating electrical drives and servo motors into industrial automation facilities. With their wide variety of inserts (male or female housings may have either male or female contacts), these connectors are equally suited for applications involving signal or power transmission or in the Hybrid version both power, signal and/or data. M-style connectors are categorised by the size of the threaded locking nut. M23 threaded coupling connectors are mainly used for integrating electrical drives and servo motors into industrial automation facilities. 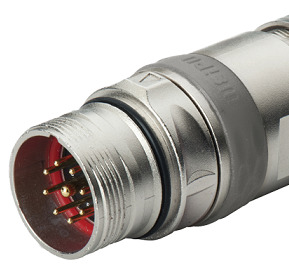 With their wide variety of inserts (male or female housings may have either male or female contacts), these connectors are equally suited for applications involving signal or power transmission or in the Hybrid version both power and signal. M23 connectors can carry a load of up to 150/300 V at 8/20 A. They are designed to be resistant to the penetration of all particles and substances to level IP67. It is obviously important that the plug components will not loosen due to vibration. In addition, the cable and connector must have EMC shielding for some applications. This ensures that external interference cannot influence the signals passing through the cable whilst it also prevents the transmitted signals in the cable from interfering with other cables or components. The new bayonet lock M23 HYBRID circular connector from Conec enables the transmission of signals, data, and power safely using just one compact and robust M23 connector – thus saving costs and installation space in interface wiring. For conventional wiring of motors, servo-drives or linear units/drives, time and costs for cabling, maintenance and diagnostics are very high as separate cables from the switch cabinet are used for the power supply and control of every single motor. This new CONEC SuperCon® series combines power supply and data transmission in one single connector. Depending on the application, three metric shell sizes, B12, B17 and B23, are available. While the number of pins and the permitted voltages vary depending on the size, the 360° shielded data core is always the same and designed for industrial ethernet Cat 5e with wire cross section AWG22. Connectors are available overmoulded to cable, field attachable, and as receptacles for device-side installation. Each pin layout is available with at least 2 different codings – visibly marked by different colour rings. Thus, mis-plugging is impossible in different applications. Sockets are available in various housing variants for front and back panel mounting, and the installation heights vary on the outside or the inside of the housing. Typically used for providing high performance, reliable and robust connections in commercial and industrial automation applications, these IP67 rated signal and power connectors offer a high degree of protection against environmental factors such as water, dirt and moisture. Different sizes of Hybrid connectors are available for power classes from drives or devices to offer maximum flexibility, whether for small DC drives or powerful servo drives. Hybrid connectors were developed for PC based open control and automation solutions (like those from Beckhoff) in a wide variety of different applications, ranging from CNC-controlled machine tools to intelligent building automation.